Developments in the last few years in earth science education can be characterized by a shift towards a systems approach to teaching and curriculum development. The software "A Virtual Journey within the Rock Cycle", a microworld game, was developed in order to assist junior and senior high school students, who have already learned about the rock-cycle's processes and products, in developing a dynamic and cyclic understanding of the earth's crust system. Preliminary observations indicated that that the software induced great enthusiasm, fostered collaborative group work and brought students to recall and reflect upon knowledge previously learned. Additionally, it was found that the teacher's role as a mediator was critical for enabling students to maximally benefit from the software. GeoScape is a landscape design, consisting of colored gravel, strategically placed flagstone and boulders, and two vertical features that simulates the geology of some fictitious region (a combination of geologic features in Utah, Arizona and Nevada). The design incorporates many topographic and geologic concepts that introductory geology students are expected to understand. GeoScape is an educational tool employing "hands-on", inquiry-based, and cooperative learning techniques to help students develop problem solving and critical thinking skills by applying their geologic knowledge to a simulated field situation. Students are charged with the task of producing topographic and geologic maps and a report on the geologic evolution of the area to help solve problems in resource exploration and geologic hazards. GeoScape illustrates three-dimensional geologic structures on a smaller scale to help students visualize concepts such as bedding tilt, plunging folds, unconformities, and stratigraphic principles. GeoScape can also be used to provide at least a simulated geologic field experience to disabled students or students taking evening classes who otherwise would be unable to participate in a traditional field exercise. GeoScape is relatively easy to build and could be constructed in a variety of areas where geologic exposures are scarce or field excursion resources are limited. We describe a multiple-week reservoir characterization lab for sedimentary geology that utilizes collection, analysis, and interpretation of outcrop and subsurface data on a fluvial unit that we use as an analog for a hypothetical hydrocarbon reservoir. Students conduct analyses of (1) sedimentary facies and structures, (2) stratigraphic surfaces, (3) porosity and permeability, and (4) gamma-ray logs using data they collect in the field and lab in addition to data available on the course web site. British Petroleum (BP) collected the dataset in the course of a research projects, and subsequently donated it to the University of Oklahoma; accordingly, it is an extremely rich and entirely realistic dataset, yet is highly accessible and modular in nature. Field data are collected during a trip to the outcrop conducted in the first lab session; a virtual field trip using materials available on a CD (available from the authors) can be conducted by schools far afield of the outcrop site. In subsequent lab sessions, students analyze their field data in addition to data they examine in lab (thin sections, hand samples), and data available on the website (petrophysical measurements). Ultimately, students synthesize their data and assess the character of fluid flow through the reservoir by considering lateral and vertical facies behavior. Students individually collect and analyze most of the data, but orally present their synthesis in teams. This exercise allows students to hone their skills in field-data collection, and analysis and interpretation of a variety of real-world sedimentary geology data types, and provides the chance to integrate such data to address a realistic case study. Course management software allows instructors to introduce an Internet-based component to their classroom teaching even without any prior knowledge of HTML language. 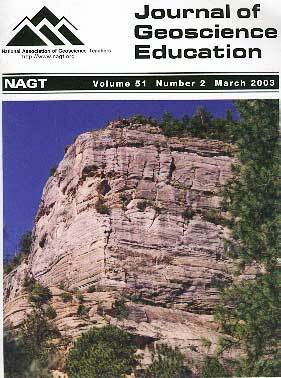 I used one of the most widely available software, WebCT, for two introductory geology classes of approximately 250 students each at Iowa State University in fall 2001. The software is easy to use and I established a variety of content and communication tools in less than a day, using the procedure described in the paper. Student responses to the use of WebCT were in general positive and they especially liked the opportunity to communicate with me, to keep track of their assignments with the "Calendar" tool, and to view their grades online. Students who earned good grades in the class are also the ones that made more extensive use of WebCT, especially with the "Discussion" tool. However, it cannot yet be demonstrated that the use of WebCT helps learning in a measurable way. Many content- or skill-based labs can be revised to explicitly involve the scientific method by asking students to propose hypotheses before making observations. Labs in which this method has been successfully applied include skill-building labs such as topographic map labs, content-based labs involving experiments with models, and field labs. Because these labs force students to state their expectations before making observations, they allow students to test their own models for various processes, making the students feel more engaged in the observations. Students' self-assessment shows that they felt that they learned a great deal from this style of labs, and that they found the labs to be fun. However, students felt that they learned little about the scientific method because they believed they already understood it, although other assessment methods suggest that their understanding was incomplete. By explicitly asking students to state and test hypotheses in the course of many labs, this type of exercise reinforces other discussions of the scientific method, and gives students a better understanding of how scientists think. The Schools of the Pacific Rainfall climate Experiment (SPaRCE) is a cooperative educational and research project that involves elementary, middle, and high schools, trade schools, colleges, and meteorological services from various Pacific Islans, atolls, and the U.S. The educational materials that the program provides to Pacific area schools involves mostly the use of non-technical, simple equipment and experiments. This is due t the cost of materials and postage, and the fact that most schools are isolated, lack funds, or do not have reliable electricity. The material sent to participants include plastic direct-read rain gauges, workbooks, and videos that discuss tropical Pacific related weather phenomenon. Recently, the SPaRCE program was able to deploy automated weather stations to a limited number of participants. In addition, the SPaRCE program had also supplied four Pacific-area schools with Micro-Tops devices, a hand-held radiometer which measures total column ozone. The SPaRCE program hopes to continue providing the participating educators with more opportunities to use technology in their geoscience curriculum. Educational research findings suggest that instructors can foster the growth of thinking skills and promote science literacy by incorporating active learning strategies into the classroom. Active learning occurs when instructors build learner participation into classes. Learning in large, general education Earth Science classes was evaluated using formative assessment exercises conducted by students in groups. Bloom's taxonomy of cognitive development was used as a guide to identify critical thinking skills (comprehension, application, analysis, synthesis, evaluation) that could be linked to specific assessment methods such as conceptests, Venn diagrams, image analysis, concept maps, open-ended questions, and evaluation rubrics. Two instructors conducted a series of analyses on sample classes taught with traditional lecture and inquiry-based learning methods. Qualitative and quantitative analyses show that such methods are preferred by students, improve student retention, produce no decrease in content knowledge, promote deeper understanding of course material, and increase logical thinking skills. We have developed an exercise for the geoscience classroom that uses the LAVA" lamp as an analogy to introduce general education undergraduate students to oceanography. The exercise provides a link between previously learned (from their secondary educational experience) and new knowledge by placing basic principles of science within an oceanographic context. Previously learned concepts that are built upon in the exercise address the properties of matter, the transformation of energy, force and motion, and the global processes that shape the Earth. The exercise requires students to compile an extensive list of observations using the lava lamp, to derive meaning from these observations and share this meaning with their peers, and to apply this meaning to new course content. Some of the more common observations recorded by students deal with changes of state in matter, differences in density among the lamp's components, the influence of temperature on density and thus on buoyancy, the formation of convection cells, and thermal expansion of fluid volume. We have found the exercise to be a useful way of introducing lower-division students to such related processes as adiabatic atmospheric circulation, global warming and sea level rise, and most especially magma movement contributing to global plate tectonics. Over a 4-term period from Spring 2000 to Fall 2001 an introductory, non-majors geology course was offered online at Brooklyn College, and was the subject of a two-year case study of the experiences and attitudes of the enrolled students. Three major course design aspects appeared to be most important for developing a sense of comfort regardless of the specific content or delivery techniques: 1) familiarity with online learning; 2) navigation and link structure; and 3) communication. Iterative assessment and redevelopment of the course allowed for significant improvement in student comfort. Key points to consider when designing a web-based course include: 1) easing students into the new learning environment; 2) avoid complex networked navigation structures because simple, hierarchical navigation structures result in increased student comfort; 3) lead by example in email communication - email often and reply in a timely fashion; 4) let the computer act as a tutor in the form of interactive quizzes and tutorials; 5) be precise in the wording of all communication and instructions. Integration of field experiences and hands-on laboratory exerecies have been demonstrated to be effective teacing methods in the sciences. The geosciences, in particular, depend heavily on field investigations. In this study, a multi-week laboratory sequence was developed and assessed as to its effectiveness in enhancing student learning in a hydrogeology course. The laboratory sequence strives to integrate field and laboratory exercises into a cohesive unit that illustrates the physical and hydraulic properties of aquifers, and to develop links between hydrogeology and related undergraduate courses in the Earth and environmental sciences. Assessment of student learning showed a positive effect of the lab as demonstrated by concept mapping comparisons and performance on test questions. Modification of the earth's surface through urbanization can have a dramatic impact on local climate. A phenomenon known as the Urban Heat Island (UHI) effect, which is a measure of the near-surface air temperature contrast between urbanized and adjoining rural areas, can be evaluated with readily available instruments. Students in an undergraduate general education science course study this phenomenon in the Portland, Oregon area through a collaborative research project. This inquiry project includes background content and literature review, preliminary studies, development of research questions, experimental design and implementation, data analysis and report writing. This project successfully enables students to collaboratively generate a data set that is amenable to sophisticated and interesting analysis and provides an opportunity to study a phenomenon in their local environment. We instituted the new course "Geocommunication" as one of four required courses in our recently revised geology M.S. curriculum. The course was specifically designed to address our students' needs, especially in the areas of organizing and writing scientific journal articles, thesis proposals, and research proposals. Our underlying goals were to impress students with the importance of communication skills in the geosciences and to help get their professional careers off to a good start. The course was centered on two major projects: a manuscript for a professional journal and a research proposal. Using data from a short field exercise, students wrote their journal manuscripts one section at a time (Materials and Methods through Conclusion, then Introduction and Abstract). The research proposal was patterned after a thesis proposal or a proposal for external funds; both versions involved fellow students as "external reviewers." The course ended with oral presentations of these proposals. Students completing the course indicated that it had been successful in improving their communication skills and that the course should be retained in the curriculum. Most of their suggestions for improvement dealt with the topics covered and the relative amount of time devoted to each. When asked to provide a subjective assessment of student improvement attributable to the course, other departmental faculty reported improved writing performance and presentation skills for the majority (but not all) of students who had enrolled. A well-coordinated seminar series centered on popular and current topics presented by dynamic, enthusiastic speakers can provide an important programmatic highlight on campus. Over 6 years we have produced 11 lecture series with over 40 individual talks at a moderate-sized community college and small selective liberal arts college. These experiences have provided us with insight as to successful strategies for running well-attended lecture series for the entire campus. The focus of specific talks or series themes should be on topics that have broad appeal and deal with contemporary or regional issues. We include talks that link science to human culture, public policy, politics, economics, or mainstream topics or disciplines. To keep a wide audience engaged, we remind the speakers that they need to communicate their message to a general audience, and it is crucial that talks are not too technical. Positive attention from a well-run, high profile, well-attended public lecture series may bring unexpected rewards to your program. Use of inquiry-based projects is an effective strategy for preparing undergraduates for independent research projects as seniors and later in their professional lives. Students used to a lecture-based format must, at first, be guided through the inquiry process so they better understand what resources are available for research and how to design and conduct a research project. In geomorphology, the question, "Why do some streams braid and other meander? ", provides a focus that motivates students to learn, generates numerous hyporthses to test, lends itself to being studied through a variety of resources, and is of sufficient importance in the scientific community to warrant extended investigation within the context of a traditionally content-heavy course. Adaptation of numerous inquiry-based projects in several courses sequences through a major, each with a student's first inquiry experiences in introductory course with the tools and skills necessary to complete an independent senior research project.